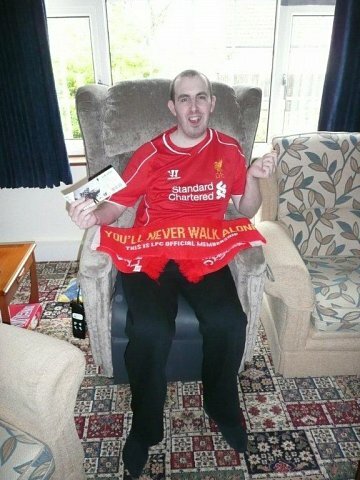 Our applicant Robert is a Liverpool supporter but unfortunately he is not well enough to travel to Liverpool so we desperately tried to obtain a wheelchair space for him at a London club where Liverpool was playing. We were not very successful, but then Liverpool qualified for the semi-final of the FA cup and our lovely ambassador Ray managed to get 2 VIP tickets for Robert and his carer to go to Wembley to watch his team. Liverpool kindly sent him a goody bag. Here is Rob in his Liverpool scarf and shirt with his VIP ticket waiting for the taxi to pick him up to take him to Wembley.